General Hospital (GH) spoilers tease that Nathan (Ryan Paevey) will head off on a bold mission soon. After Dr. Obrecht (Kathleen Gati) confirms Faison (Anders Hove) is his father, Nathan will try to track him down. He’ll gain a fun partner for the journey ahead. GH has quite an adventure planned and it involves Lulu’s (Emme Rylan) latest story. Lulu will hit a few snags as she works to find Faison and get the scoop of a lifetime. She’ll also face more backlash over this goal. Nevertheless, Peter (Wes Ramsey) will remain in Lulu’s corner. He’ll cheer her on and urge her to put the naysayers out of her mind. Peter will be convinced that Lulu’s got what it takes to locate Faison and get all the info she needs. When Lulu’s efforts get her in trouble, Peter will rush to her defense. He’ll think the public deserves to hear about Faison’s role in the twin saga. Peter might argue that Jason (Steve Burton) and Drew (Billy Miller) would benefit, too. Anything Lulu discovers could help. Jason and Sonny (Maurice Benard) still have many unanswered questions, so Lulu could be doing them a favor. General Hospital spoilers state that Nathan will have questions as well. He’s still hung up on getting medical records for his little one. Nathan can’t shake his fears that something they don’t know could affect the baby. He might want to fill Faison in on his paternity and ask for some information. Still, we have to acknowledge the fact that Faison’s a fugitive and Nathan’s a detective. Does Nathan really just want to talk to his dad? Will he try to pull something and take Faison into custody? Regardless, Lulu and Nathan could be putting their lives on the line. They’ll team up to search for Faison, but Dante (Dominic Zamprogna) and Maxie (Kristen Storms) certainly won’t approve. Can Nathan and Lulu escape the peril that awaits or are they in for a rough time? Will Maxie and Dante’s worst fears come true? 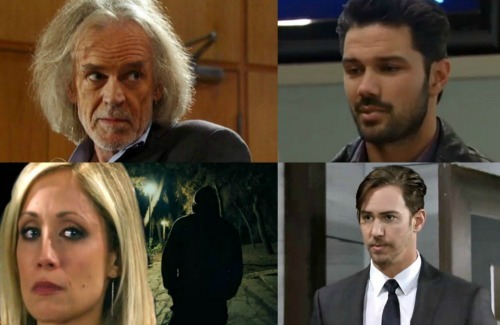 General Hospital spoilers say the action’s about to rev up, so stay tuned. We’ll give you updates as other GH news comes in. Stick with ABC soap and don’t forget to check CDL often for the latest General Hospital spoilers, updates and news.